Cecil Balmond was selected as the winning artist to create an artwork for the Crime Detection Laboratory in Anchorage, Alaska. The art committee wanted an intriguing art piece that also addressed an aspect of the fallen hero for officers who had lost their lives in the carrying out of their duties. The Crime Lab works with enforcement officers in the region to assist in detection work and advanced forensic technology. Snow Words is an abstract time piece embodying a code. The secret to the artwork is based on repeat motifs that in turn are spaced out in an aperiodic sequence. The spacing of the lights, with its gaps and solids, draw inspiration from prime numbers – part of the fabric of the Universe. Located in the lobby of the Crime Detection Laboratory, Snow Words is suspended between a glazed skylight and the mirrored floor that it reflects into. Measuring 9m high, when viewed from above the tower of light looks as though it is emerging from the ground. 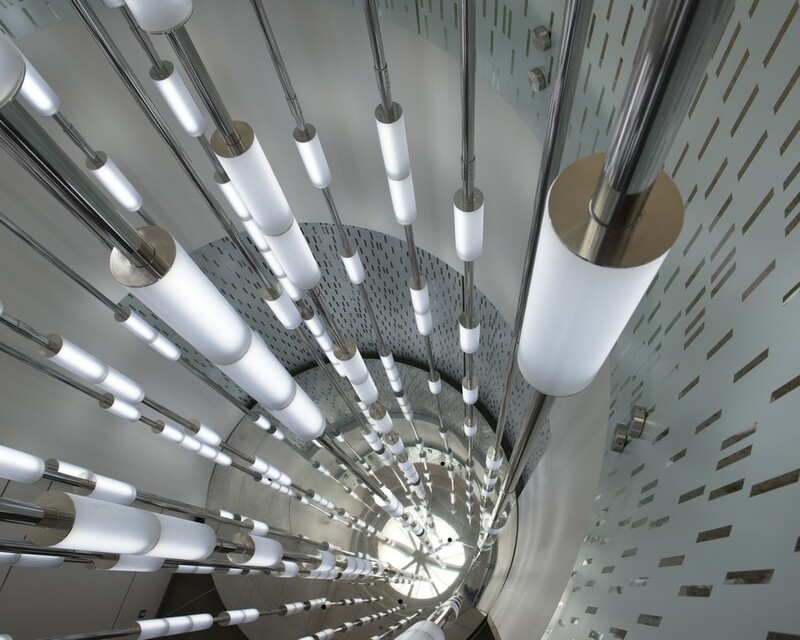 The artwork features 24 aluminium tubes and 206 lights encased in acrylic. 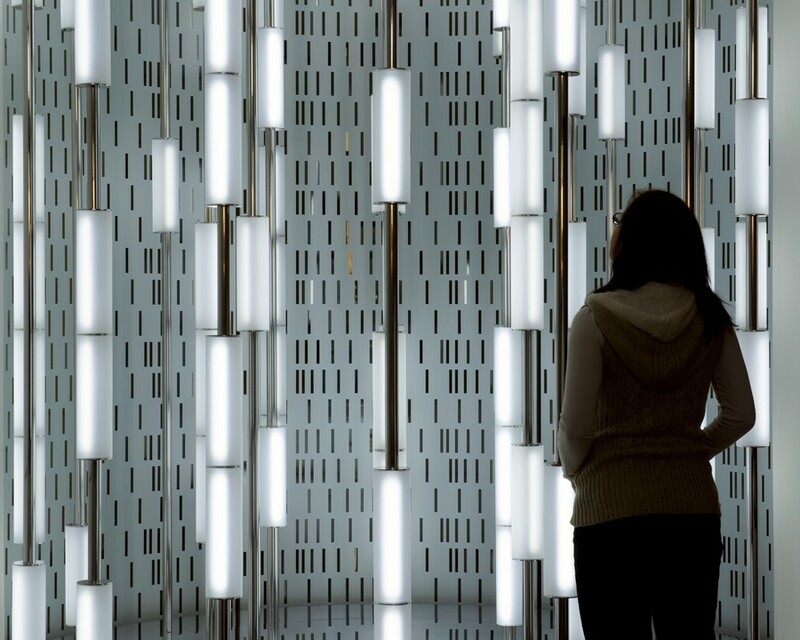 LED strips are skilfully placed inside through laser cut slots from which a bar of light takes shape, floating within the enclosure. Widely considered to be one of the most influential creators of his generation, Balmond successfully occupies multiple roles as artist, designer, architect, engineer, theoretician and writer. His approach is one of investigation and draws on 40 years of research into diverse forms. Through a unique interrogation of science, geometry and the structure of the non-linear, Balmond radically reorganises space and creates new horizons in art and architecture. Former deputy chairman of Arup, Balmond runs his research-led workshop, Balmond Studio, in London, UK and Colombo, Sri Lanka. 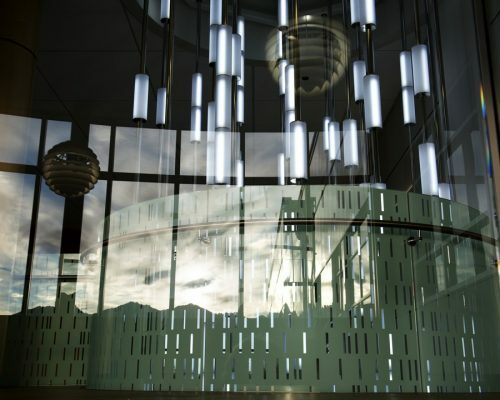 Ongoing projects include a $700m mixed use development in Asia, a national monument to mark the England/Scotland border crossing at Gretna Green called Star of Caledonia, for which Cecil is the wining artist, and net_Work, a public artwork for a higher education centre in Canada. Balmond has exhibited internationally including solo shows in Japan, France, Denmark and Chicago. Recently he co-designed the ArcelorMittal Orbit with Anish Kapoor for the London 2012 Olympics. Balmond currently holds the Paul Philippe Cret Chair at Penn Design as Professor of Architecture where he is also the founder of the Non-Linear Systems Organization (NSO), a material and structural research unit at University of Pennsylvania. He has also been Kenzo Tange Professor at the Harvard Graduate School of Architecture, Saarinen Professor at Yale University School of Architecture and Visiting Fellow at the London School of Economics. Balmond’s awards include the 2002 Japanese Gengo Matsui prize for the Serpentine Gallery pavilion he designed with Toyo Ito, which was based on an algorithm created by Balmond, the RIBA Charles Jencks Award for Theory in Practice in 2003 and the Sir Banister Fletcher Prize for his book, informal in 2005. His other publications include Element (2007) and Number 9 (1998). The Scientific Crime Detection Laboratory at Anchorage is responsible for carrying out fieldwork and research applying current and emerging scientific methods to crime detection. The team provide DNA, biological and forensic support to all law enforcement agencies in Alaska and are also responsible for training officers in proper evidence collection and preservation techniques. Alaska was the last State to build its own crime laboratory in 1984. The new facility, which opened in 2012, was designed to replace the old building and accommodate the increasing needs of the State. Anchorage is Alaska’s largest city, with almost 300,000 residents and constitutes more than 40% of the State’s total population. It has a subarctic climate and is protected by the Chugach Mountains to the East and warmed by Japanese currents of the Pacific Ocean from the South-West. Located at 61º North it has extreme lighting conditions – for example, on Summer Solstice, it receives 22 hours of daylight when the sun rises at 4:20 a.m. and sets at 11:42 p.m.